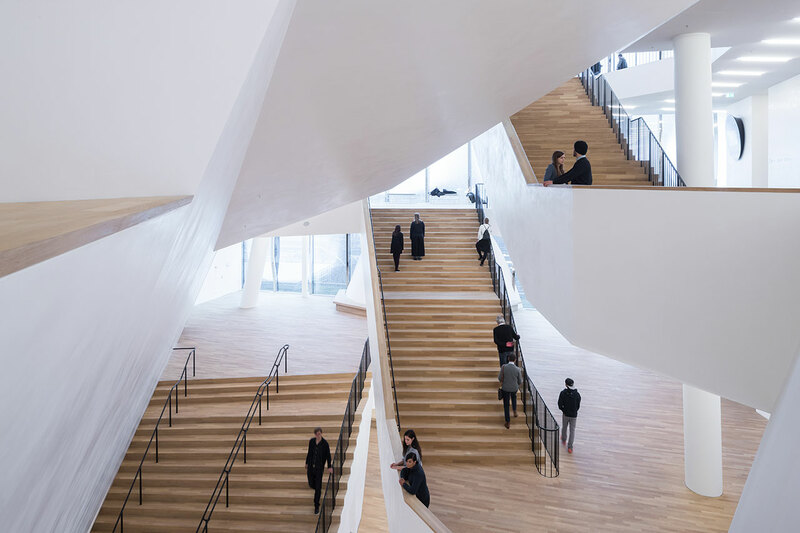 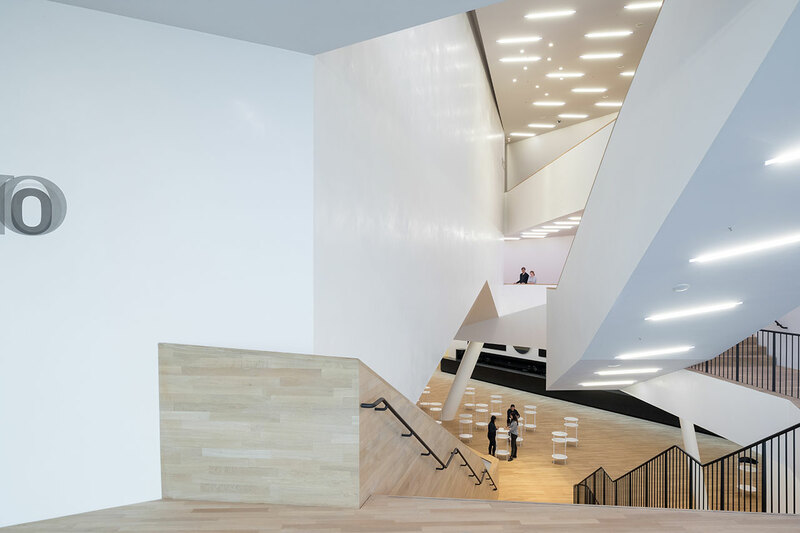 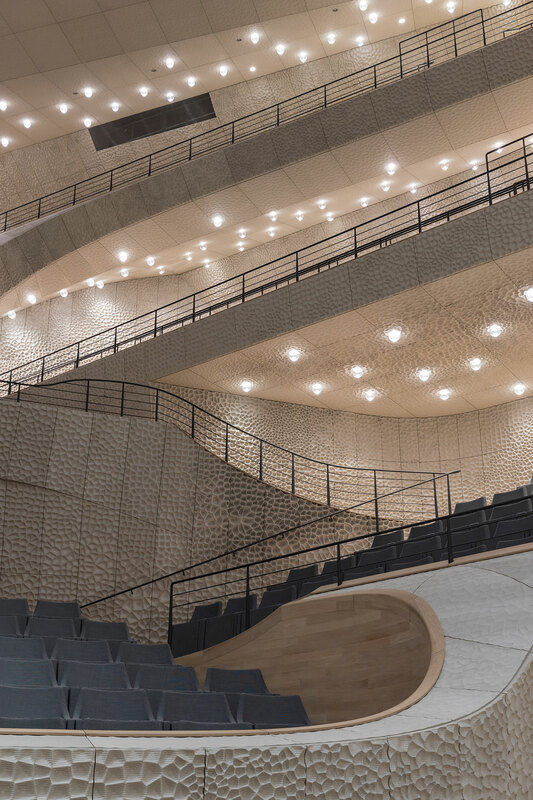 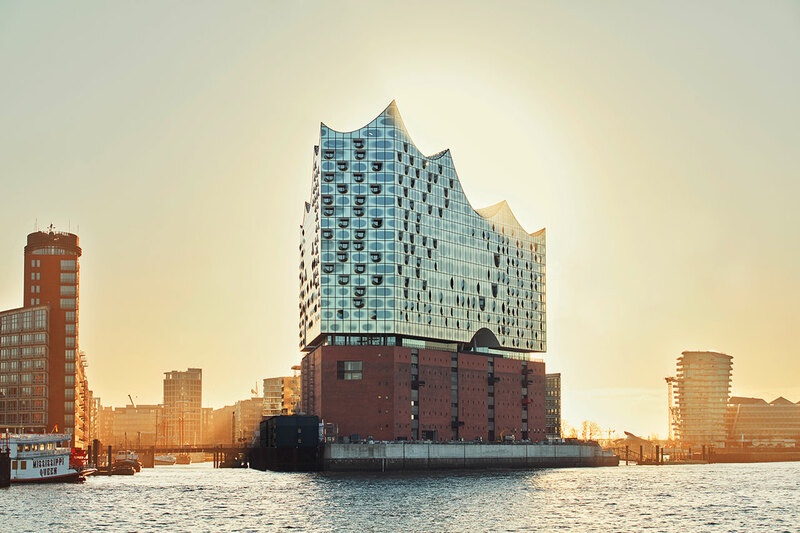 While it may have taken 13 years for Herzog & de Meuron’s Elbphilharmonie to “dock” at Hamburg’s harbour, having finally opened its doors to the public on January 11 after long delays due to rising costs and legal issues with the contractor, t was definitely worth the wait. 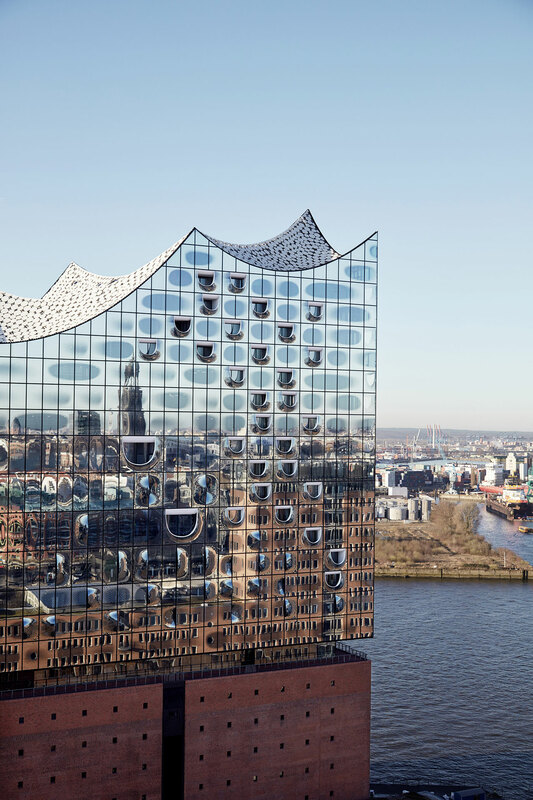 Sitting atop an existing brick warehouse like a crystal sculpture on a pedestal or a glass castle on a rock, the city's new landmark, at once both architecture and art, majestically soars above the city, gleaming with reflections of the river below and the sky above. 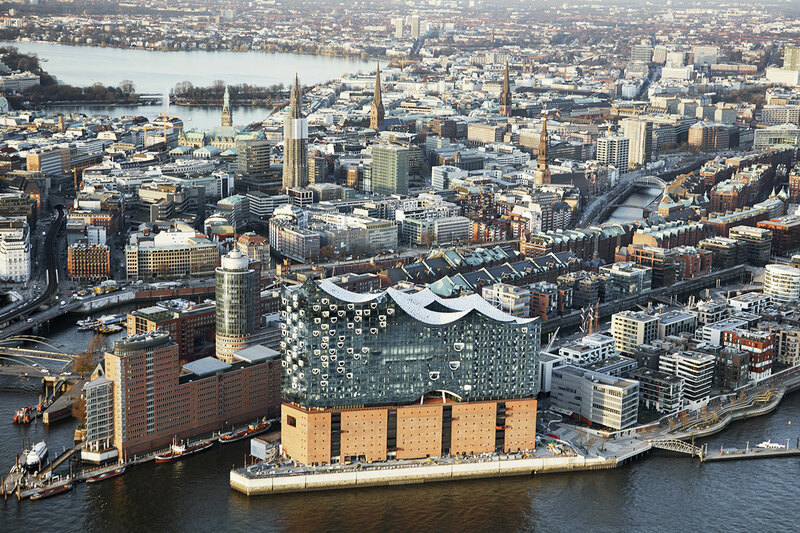 The Elbphilharmonie was designed as a new centre of social, cultural and daily life for the people of Hamburg and as such, apart from the Philharmonic’s various functions, which include three auditoria and Musical Education spaces, also houses a five star hotel, 45 luxury apartments, restaurants and bars as well as a car-park and a public plaza which serves to weave all of these facilities together. 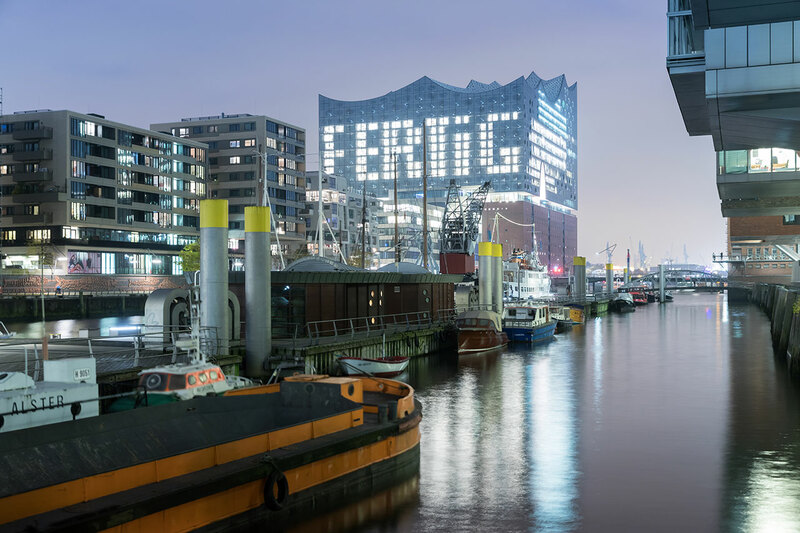 Herzog & de Meuron’s new glass structure rises on top of Kaispeicher A, a massive brick 1960s warehouse used to store cocoa, tea and tobacco that was decommissioned at the end of the last century. 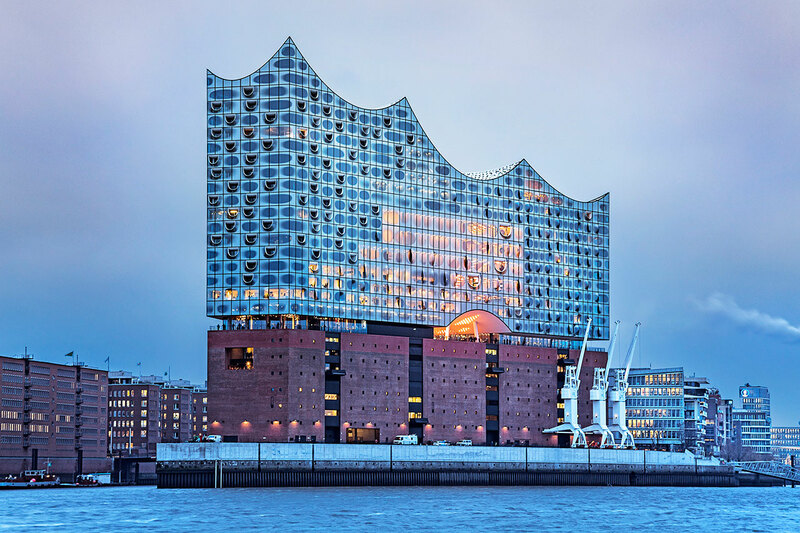 The architects chose to preserve it as it was considered the ideal foundation for the new Philharmonic both for its sturdiness and the uniqueness in its austerity—most warehouses at the city’s port designed in the 19th century echo the superfluously decorative vocabulary of the period in order to blend in with the rest of the city fabric. 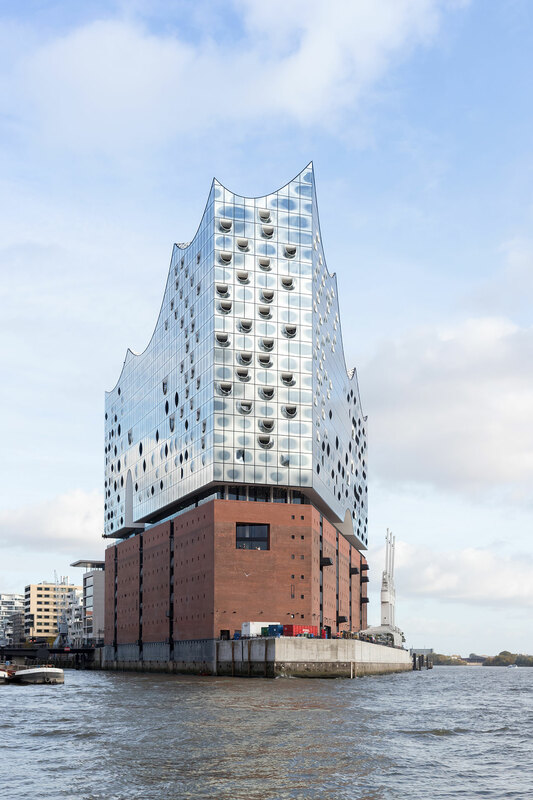 Extruded from the Kaispeicher, while the new building’s glass volume shares the same exact prismatic floor plan as the brick block below, it eschews its rectilinear vocabulary for an undulating roof-scape that resembles the crests and troughs of wavy waters. 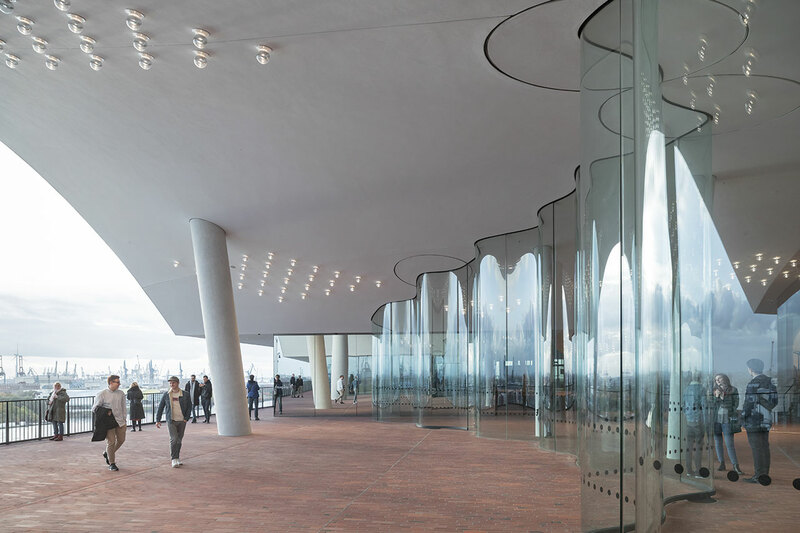 The glass façade, reaching a height of 108 meters above the river Elba at the tip of the peninsula -the highest building in town- is made up of 1,100 unique window panels, some of which have been intricately curved to bulge or pucker amidst the otherwise smooth façade, whereas others open up to form balconies. 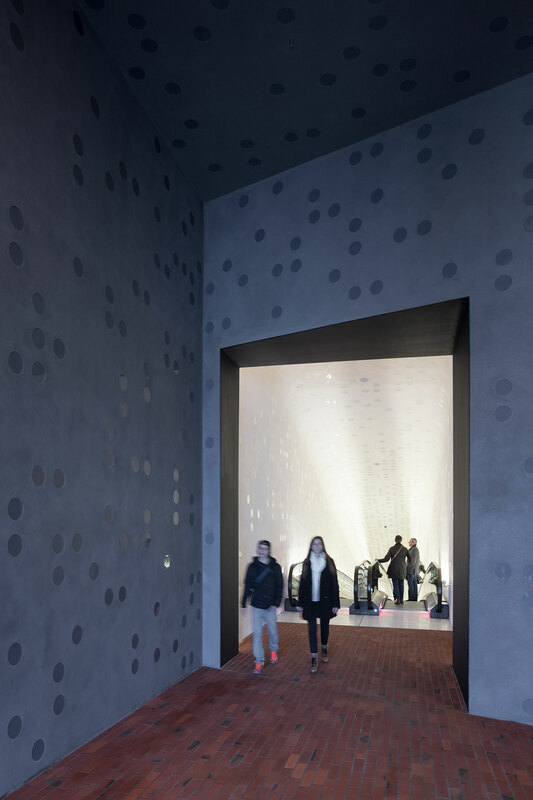 The panels also feature individually printed patterns made up of chrome dots that change colour in response to the shifting light, adding to the building’s crystal-like appearance. 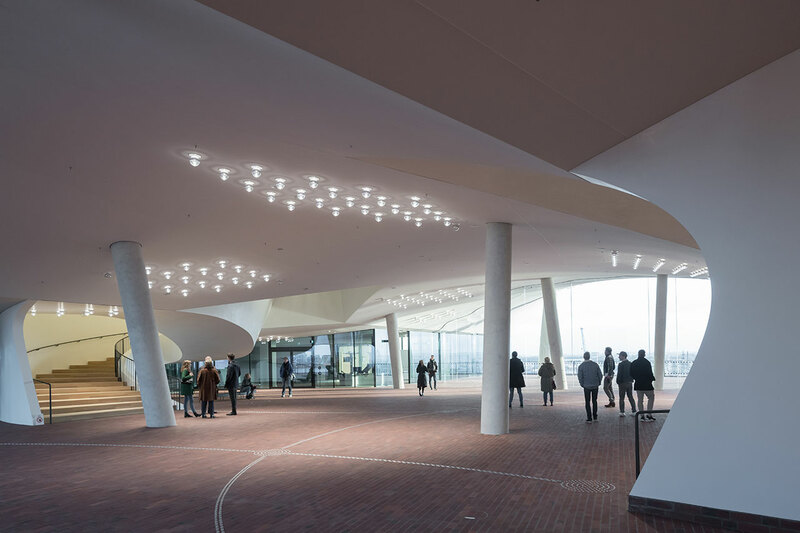 Nested 37 meters above ground between the brick-clad pedestal and the soaring glass structure above, the public plaza is a buffer zone the size of Hamburg’s Town Hall Square that connects all the various facilities of the complex—the ticket office and hotel lobby are located here, as well as access to the auditoria’s foyers. 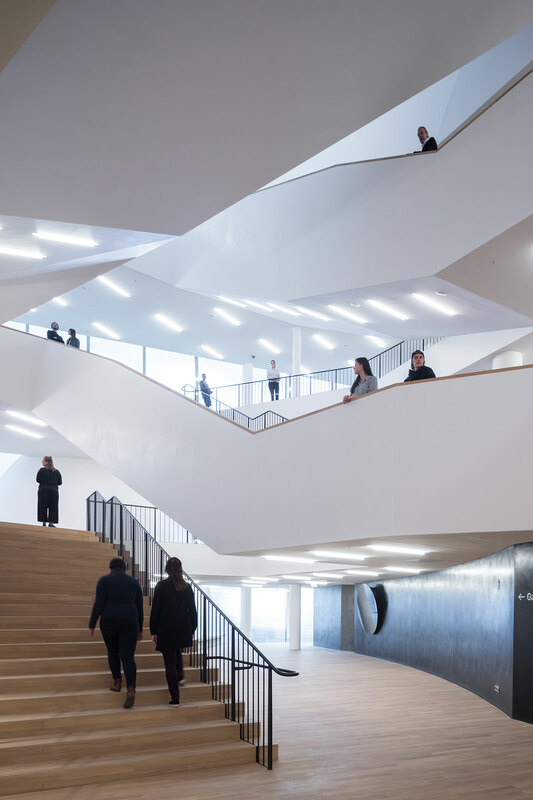 Offering visitors the chance to enjoy panoramic views of both the harbour and the city, it also features an outdoors promenade that circles the entire building. 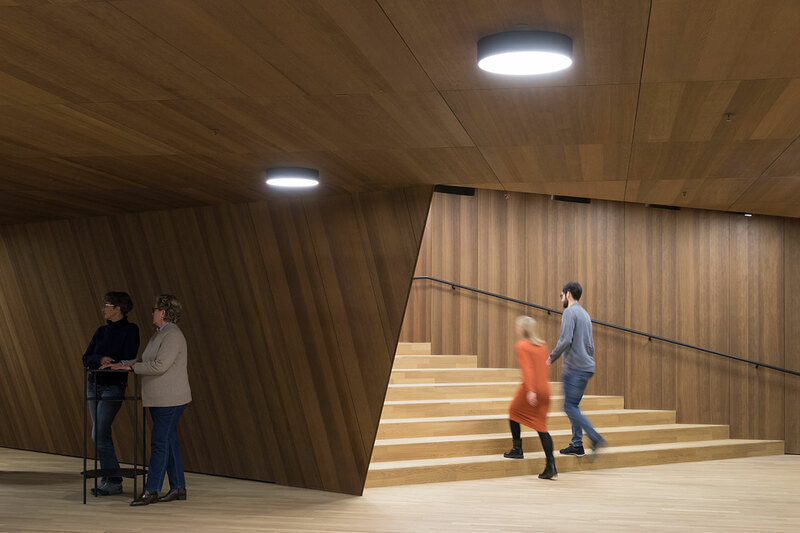 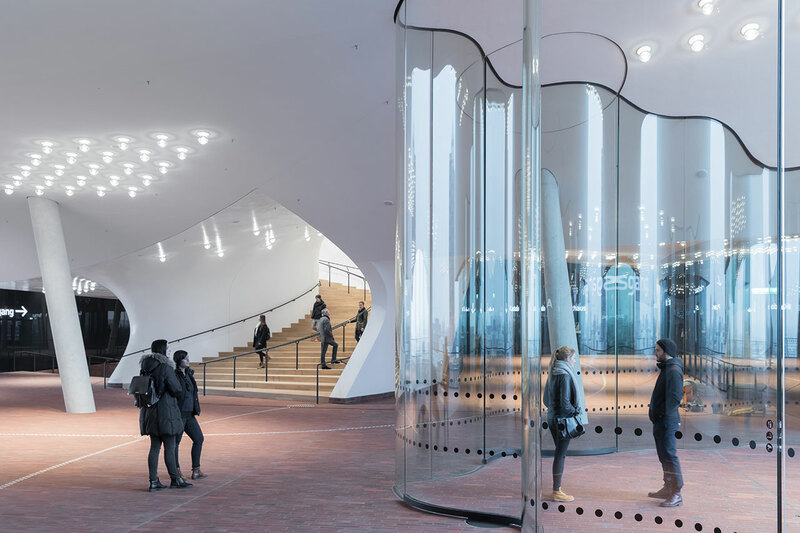 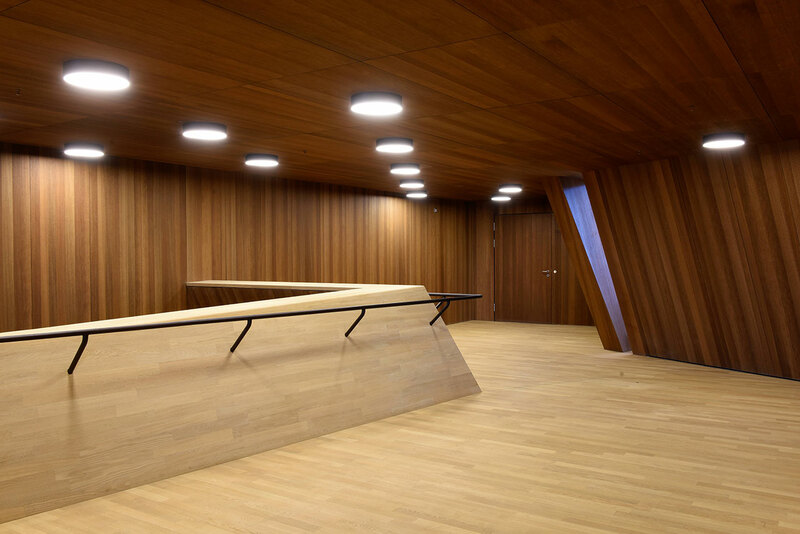 To access the plaza from the dock level, visitors ride an exceptionally long escalator that bores through the massive Kaispeicher on a shallow curve that ingeniously creates a sense of anticipation as the other end is concealed from view. 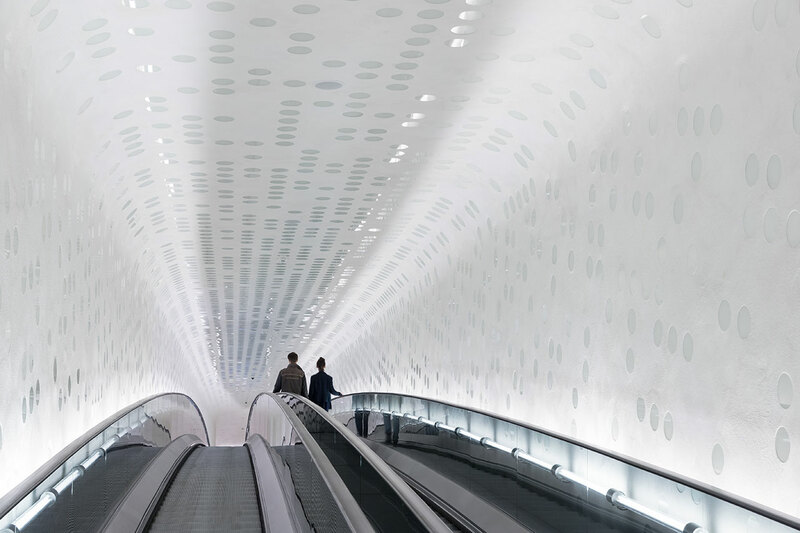 Landing on a platform with a large picture window that offers the first panoramic glimpses of the city, they then ride a second escalator that brings them to the plaza, a sculptural space of curving walls, vault-like folding ceilings, undulating glass screens and inclined columns. 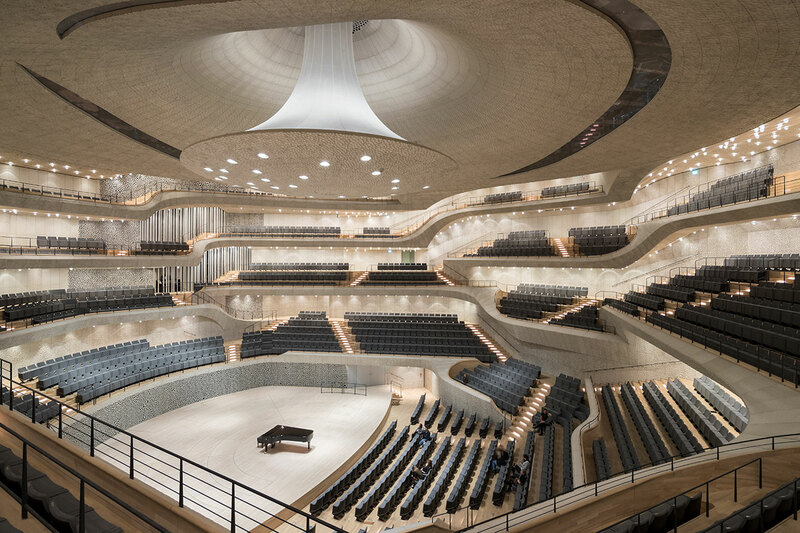 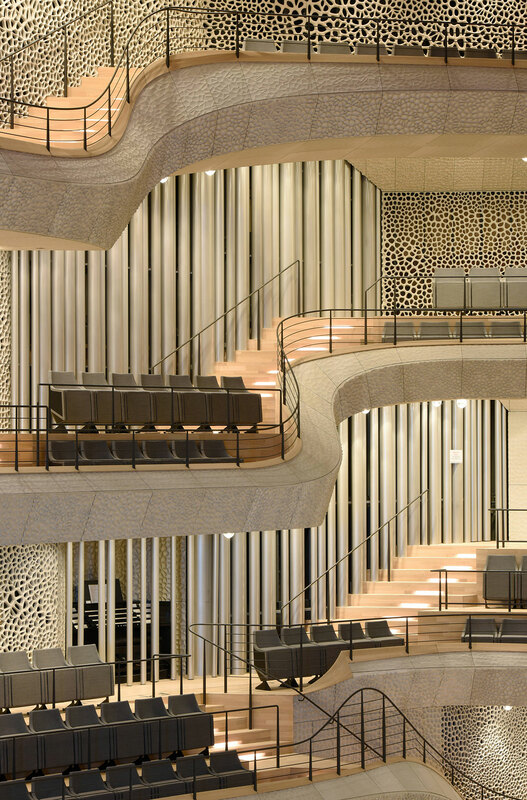 At the heart of Elbphilharmonie, above the public plaza, is the Grand Hall, the largest of the three concert halls with a seating capacity of 2,100. 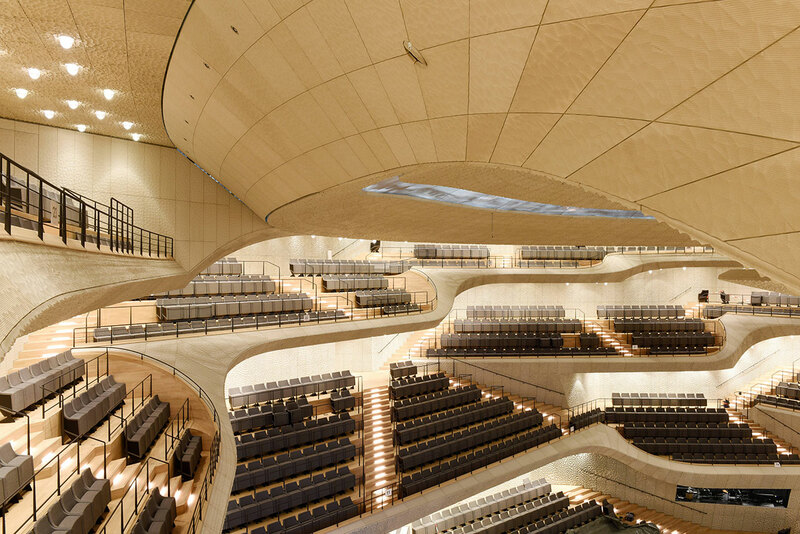 Designed as a vineyard, a typology pioneered at the Berlin Philharmonie in 1963, it features a performance stage at the center encircled by terrace-like balconies that allow for an almost interactive proximity between audience and players, as no one is more than 30 metres from the stage. 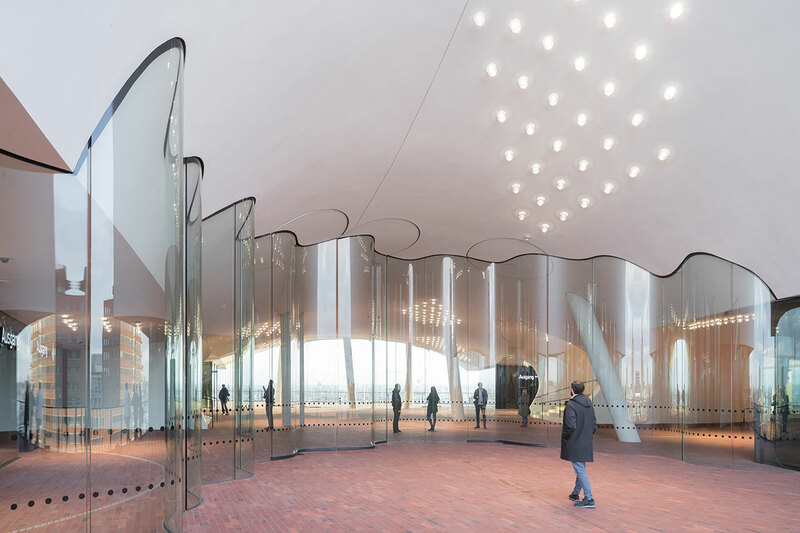 Suspended from the vaulted ceiling and designed in collaboration with internationally acclaimed acoustician Yasuhisa Toyota, a large sound reflector ensures excellent acoustics, as does the sound-modulating ‘white skin’ surfaces of the gypsum fibreboard panels, each individually computer-designed, which themselves resemble something between wrinkled elephant skin and the texture of moon rock. 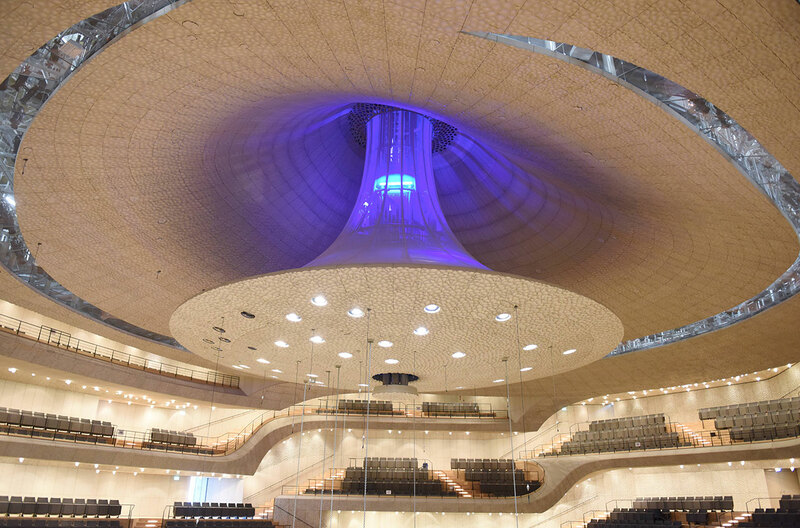 The tent-like volume of the Grand Hall is echoed in the morphology of the roof, an undulating landscape of crests and troughs, clad with 5,800 circular, white, perforated aluminium plates that crown the building like frothy sea foam over choppy waters. 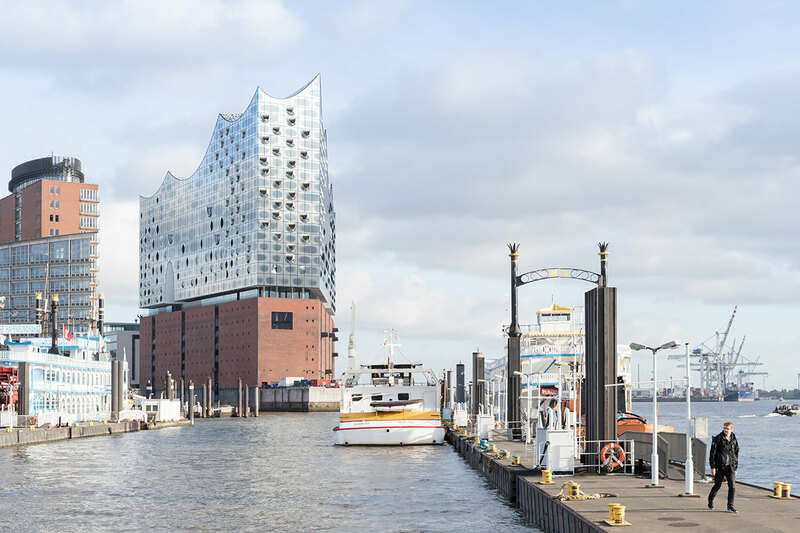 A more apt metaphor though for the already nicknamed “Elphie” would be a ship under sail, its glass sails billowing on top of its brick-clad hull, signaling Hamburg's arrival as a cultural destination definitely worth traveling to.